Thank you so much for joining us! This year we're throwing a crafty costume party for you and all of the Odd Girl's have posted Halloween costume themed creations! You might have arrived from Melissa’s blog – if so, you’re spot on! If not, you'll want to click here to go back to the beginning and make sure you hit all the houses....I mean blogs! I don't know about you but I love making my own little Halloween decor for my house and office. It's so fun to incorporate your craftyness into the spaces where you spend your most time. Here I used Vampiress (one of my favorite digi stamps!) to decorate a little coffin. One of my favorite tricks with Halloween images is to do something out of the box- like give her purple hair. I mean if there's ever a time for non traditional it's with a Halloween image right? Your next stop is Anna!! Oh!!! Kattie I need this in my life, please send it to me lol I love it a lot!! The colouring and composition/design is amazing and creative! Oh wow gorgeous colouring and coffin!! That card is amazing! I love all the elements that are incorporated that make it feel gorgeous! This is BEYOND amazing!!!! Fab FAB FAB!!!!!!!!! This is sooooo fun! I'm digging that purple hair, and the mesh stuff! 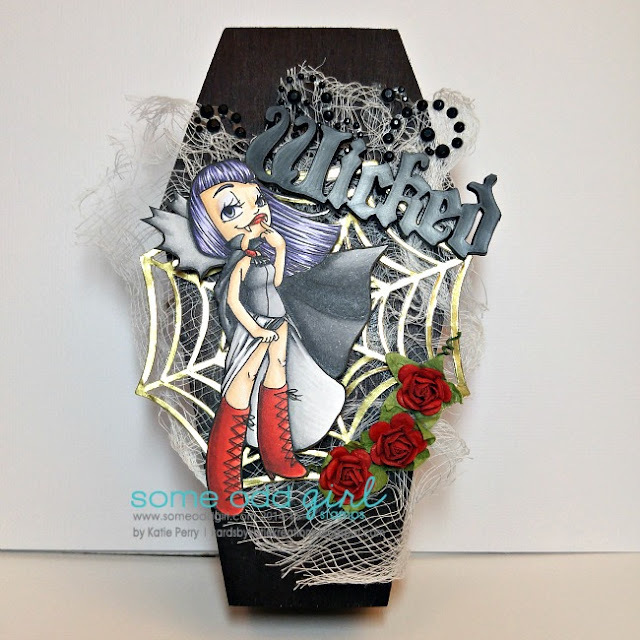 OMGosh That is truly WICKED...I love everything about your Coffin, such a cool creation. Thanks for sharing it with us. Katie I love your awesome coffin! The hair looks Marvelous, love the color! It’s always fun to think outside the box thanks for sharing. Happy Halloween! I love the purple hair and how all the elements of your project come together, fantastic work. Fabulous card!! Great celebration & happy hopping!!! So true girl and I love her hair! The whole project is fantastic!! Thank you for the trick. Love this amazing card! So cute. I love how the elements jump out of the coffin!! Katie this is so cute...you knocked it out of the park! Thanks for your tip. Your job is really amazing. Love it! Great colouring! Love the purple hair. She is super spooky! Great card! Holy smokes, this is amazing! Fantabulous job! Love that gray scheme! The gray eyeshadow blends especially nice! Thanks for sharing! What an amazing card! I love the font of the sentiment and I love your project. This is awesome!! The coffin could make a great treat holder too!! (I also love this cute little vampiress, I think I'll have to bring her home to me!! What a gorgeous card! I love everything you did, the coloring fit perfect. Thank you so much for sharing with us.